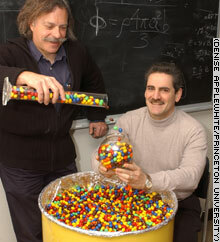 Professors Paul Chaikin, left, and Salvatore Torquato used M&M candies to reveal fundamental principles governing the random packing of particles. WASHINGTON (Reuters) -- Princeton physicist Paul Chaikin's passion for M&M's candies was so well known that his students played a sweet practical joke on him by leaving a 55-gallon drum of the candies in his office. Little did they know that their prank would lead to a physics breakthrough. The barrel full of the oblate little candies made Chaikin think about how well they packed in. A series of studies have shown they pack more tightly than perfect spheres -- something that surprises many physicists and Chaikin himself. "It is a startling and wonderful result," said Sidney Nagel, a physicist at the University of Chicago. "One doesn't normally stop to think about this. If you did, you might have guessed what would happen, but you'd have guessed wrongly." The issue of how particles pack together has intrigued scientists for centuries and has implications for fields such as the design of high-density ceramic materials for use in aerospace or other industries. Chaikin and his colleague, chemist Salvatore Torquato, used the candies to investigate the physical and mathematical principles involved when particles are poured randomly into a vessel. Writing in Friday's issue of the journal Science, they said they found that oblate spheroids -- such as plain M&M's -- pack surprisingly more densely than regular spheres when poured randomly and shaken. When poured in, they said, spheres occupy about 64 percent of the space in a container. M&M's manage to pack in at a density of about 68 percent. "We just stretched a sphere and suddenly things changed dramatically," said Torquato. "To me, it's remarkable that you can take this simple system with common candies and probe one of the deepest problems in condensed matter physics." Mars Inc., which makes M&M's, did not help sponsor the research although it donated 125 pounds of almond M&M's to Chaikin, Princeton said in a statement.